The DATA step creates a data set prior that specifies the prior distribution for the variable current, which in this case is a normal distribution with mean 100 and variance 50. This reflects a rough belief in a positive coefficient in a moderate range for current. The prior distribution parameters are not specified for experiment and the interaction between experiment and current, and so PROC GENMOD assigns a default prior for them, which is a normal distribution with mean 0 and variance 1E6. The BAYES statement in PROC GENMOD specifies that the regression coefficients follow a normal distribution with mean and variance specified in the input data set named prior. It also specifies 1 as the seed for the random number generator in the simulation of the posterior sample. The MODEL statement requests a logistic regression model with a logit link. The STORE statement requests that the fitted results be saved into an item store named cowgmd. The convergence diagnostics in the output of PROC GENMOD indicate that the Markov chain has converged. Output 75.4.1 displays summaries on the posterior sample of the regression coefficients. The posterior mean for the intercept is –3.5857 with a 95% HPD interval . The posterior mean of the coefficient for current is 1.1893 with a 95% HPD interval , which indicates a positive association between the logit of response and the shock level. Further investigation about whether shock reaction was different between two experiment is warranted. Each line in the ESTIMATE statement compares the fits between the two groups at each current level. The nonpositional syntax is used for the interaction effect current*experiment. For example, the first line requests coefficient 1 for the interaction effect at current level 0 for the initial experiment, and coefficient –1 for the effect at current level 0 for the repeated experiment. The two terms are then added to derive the difference. For more details about the nonpositional syntax, see Positional and Nonpositional Syntax for Coefficients in Linear Functions in Chapter 19: Shared Concepts and Topics. The EXP option exponentiates log odds ratios to produce odds ratios. The CL option requests that confidence limits be constructed for both log odds ratios and odds ratios. Output 75.4.2 lists the posterior sample estimates for differences between experiments at different current levels. The sample statistics are constructed from the posterior sample saved in the item store cowgmd. From the output, the odds of a cow showing shock reaction at level 0 in the initial experiment is 1.2811 (with a 95% HPD interval (0.07387, 3.1001)) times the odds in the repeated experiment. The HPD interval for the odds ratio is constructed based on the mean and variance of the sample of the exponentiated log odds ratios, instead of based on the exponentiated mean and variance of the posterior sample of log odds ratios. The HPD interval suggests that there is not much evidence that the cows responded differently at current level 0 between the two experiments. Similar conclusions can be drawn for current level 1, 2, and 5. However, there is strong evidence that cows responded differently at current level 3 and 4 between the two experiments. The possible explanation is that, if the current level is so small that cows could hardly feel it or the current level is so strong that cows could hardly bear it, cows would respond consistently in the two experiment. If the current level is moderate, cows might get used to it and their response diminished in the repeated experiment. You can visualize the distribution of the posterior sample of log odds ratios by specifying the PLOTS= option in the ESTIMATE statement. In the following statements, ODS Graphics is enabled by the ODS GRAPHICS ON statement, the PLOTS=BOXPLOT option requests a box plot of posterior distribution of log odds ratios. The suboption ORIENT=HORIZONTAL specifies a horizontal orientation of the boxes. 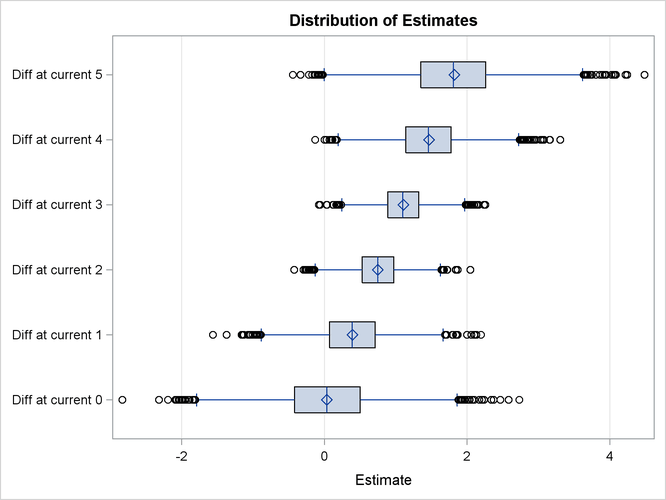 Output 75.4.3 displays the box plot of the posterior sample of log odds ratios. The two boxes for differences at current level 3 and 4 show that the corresponding log odds ratios are significantly larger than the reference value x = 0. This indicate that there is obvious evidence that the probability of cow response is larger in the initial experiment than in the repeated one at the two current levels. The other four boxes show that the corresponding log odds ratios are not significantly different from 0, which suggests that there is no obvious reaction difference at current level 0, 1, 2, and 5 between the two experiments.